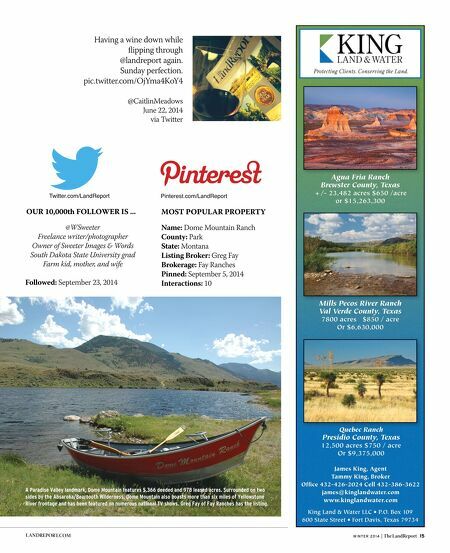 14 The LandReport | W I N T E R 2 0 1 4 L A N D R E P O R T.C O M Big Sky Rules Land Reporters focused their attention on the Treasure State, home to Elk Peaks Ranch and Dome Mountain Ranch. —Villageous LLC LANDREPORT.COM MOST POPULAR PROPERTY Name: Elk Peaks Ranch County: Madison State: Montana Listing Brokers: Bridham & Lancey Brokerage: Big Sky Sotheby's Int'l Realty Posted: June 23, 2014 Interactions: 124 LandReport.com Facebook.com/LandReport TOP FIVE CITIES BY VISITORS 1. New York 2. Houston 3. Denver 4. Dallas 5. Los Angeles Total U.S. Visits: 44,434 Elk Peaks Ranch shares a three-mile border with the Beaverhead National Forest. In addition to this recently constructed log home, it includes a century-old schoolhouse and numerous other amenities. 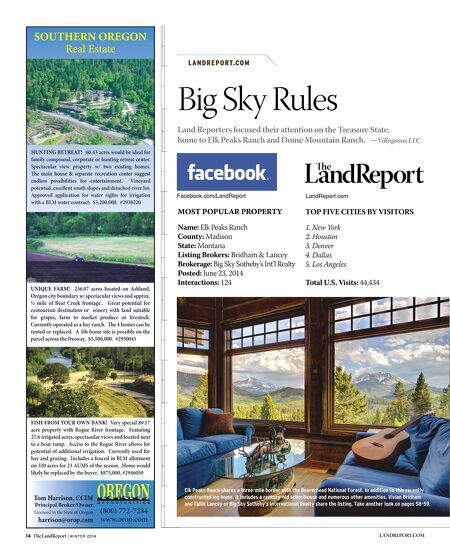 Vivian Bridham and Tallie Lancey of Big Sky Sotheby's International Realty share the listing. Take another look on pages 58-59.